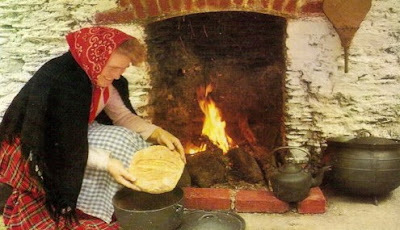 Since my father was conceived in Ireland and my grandparents emigrated to the United States from County Mayo, I owe it to my distant relatives to at least try, if not perfect, the art of baking authentic Irish Soda Bread in my dutch oven. You can watch Marion Cunningham, a wonderful cook book author, making this bread here in a Youtube episode of Baking with Julia. She makes it look so easy, I followed her recipe to a T and found the batter to be extremely sticky and a little tricky to handle. I would suggest flouring your hands and work surface well in order to shape the dough. If you're baking this on a muggy day, hold back a little on the buttermilk, you can easily go down to 1 3/4 cups of buttermilk with the same result. The loaf is supposed to be craggy and wet so don't be alarmed. I transferred the dough to my dutch oven using a plate and large spatula but if you form it on a round piece of parchment paper you can transfer it directly into your hot oven. I pre-heated my 10 inch deep dutch oven with 10 coals in a ring around the bottom, 15 around the edge of the lid with 6-7 spaced evenly in the middle. Once I added the bread, I left it alone and after 45 minutes it was golden brown and hollow sounding when I rapped the loaf. Let it cool almost completely before slicing and if you have any leftovers, wrap it well and toast it the next day. A great quick bread for campers, mix the dry ingredients at home and all you have to do is add the buttermilk when you're ready to bake. While coals are heating, in medium bowl, combine flour, baking soda and salt with a whisk or fork. When coals are ready, place hot coals above and below empty dutch oven. While oven is pre-heating, add the buttermilk and stir vigorously with a fork or wooden spoon just until the dough comes together. Turn the dough out onto a lightly floured surface and knead gently for a minute (the dough will not be smooth). Form the dough into a round loaf shape about 6 inches in diameter. Transfer dough to heated dutch oven (use spatula and plate or parchment paper as dough will be sticky). With sharp knife cut an 'X' in the top about 1/2 inch deep. Bake for 45-50 minutes at 375 degrees or until the bread is golden and sounds hollow when you tap the bottom of the loaf. Remove from dutch oven and place on rack to cool completely. Best eaten the same day, once cool, wrap in plastic wrap and store at room temperature. Made this the other day. Turned out really good. It made excellent toast.